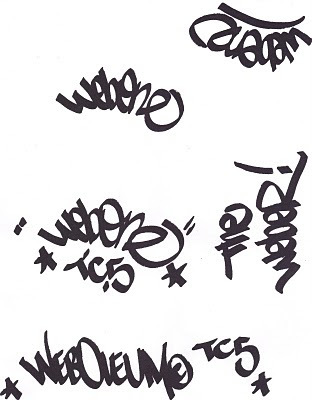 Born and raised in the Crown Heights section of Brooklyn, Web came to notice graffiti on the subways in the early 70s. It wasn't until he went to the High School of Art & Design in 1979 that he learned the art and culture of graffiti. There he met Seen, Doze, Abby, 2Cute, Mr.Wiggles(Rek), Fabel, Lady Pink, Lady Heart, Paze, Ence, Size, Par and others. After being schooled by Quasar3, he began bombing insides in 1980. Somewhere around that time, he met Staf27 and they became partners. By 1982 Web was doing pieces on the 2s and 5s and then expanded to the BMTs. Late in 1983, he joined a group called ICRY, where he met Doc TC5 and was put down in the 5. From there, it was on. Along with Ebn, Staf27 and Beam, they took over the 3 line. In late ‘85, Web and Doc visited the 1 line and made a major impact. Within that timeframe, he met Yourz (YZ) and did several cars on the BMTs and IRTs. By 1988, Web's subway career ended. In the last 20+ years, he has continued to paint and be creative, influencing generations thru his work. Artwork by WEB ONE will be on display March 6th through March 28th, 2010 at Crewest during "Revolutions".